The following represents a description of some New Haven rolling stock I have chosen to model. The title is a bit misleading, in that some models that were not in revenue service in 1959 are included as well, but these are plainly identified in the beginning of the description. One purpose for the revision of this page was to make it more user-friendly for modelers of other railroads that may be interested in having some correct New Haven cars on their layout as ‘foreign equipment’. The New Haven Railroad did not have special designations for the type of cars on their roster such as the Pennsylvania Railroad or Baltimore & Ohio with specifications such as “X29” or “M-53”. The New Haven applied standard ARA/AAR Class designations instead. In the following descriptions these will be identified by the word “Class” with a capital “C” preceding the designation. There was also a bit of rationale to the New Haven car numbering system; the road numbers increased with flat cars having the lowest number series followed by boxcars, gondolas then hoppers. In 1959 the New Haven did not roster any tank cars. During WWII the New Haven did have a sizable tank car fleet for the transportation of oil because until the construction of an inland pipeline was complete, it was considered a strategic point of national security to avoid maritime coastal shipment of oil due to the presence of enemy submarines off the coast of the U.S. At the end of WWII the New Haven retained a small number of these tank cars that were assigned non-revenue road numbers and the cars were used for the transport of diesel fuel oil within New Haven facilities only. The New Haven also did not roster any refrigerator cars. Early on, the New Haven Railroad became part of the Fruit Growers Express (reporting marks FGEX) consortium, and as such refrigerator cars (“reefers”) were assigned for service on the New Haven this ending the need for the railroad to roster any reefers itself. 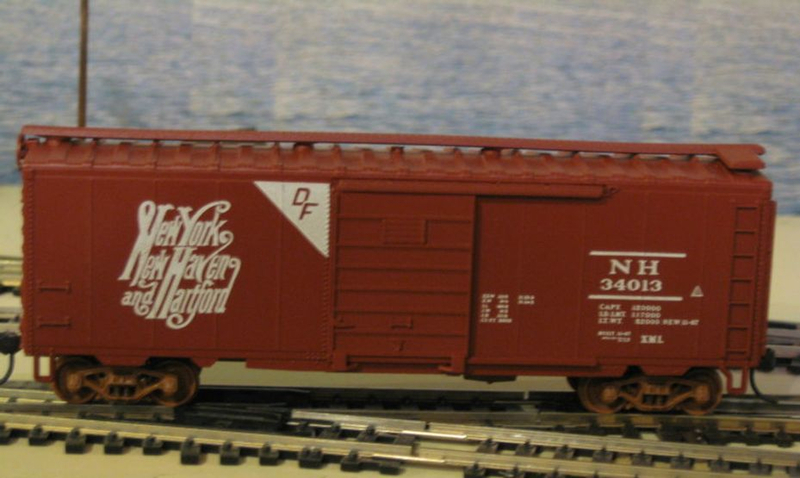 Intermountain has produced FGEX reefers that are stenciled “Return to NYNH&HRR…”, although the model is a few inches too tall. While many of my models are old and some even out of production, I’ve tried to indicate more current sources for acquiring similar models. That’s a fancy way of saying I’m old and getting older, and “back in the day” there was no where near the number of highly detailed, ready-to-roll models available as there are now. In most cases, if one wanted to model the New Haven the choices were to start from scratch with sheet wood, brass or plastic (scratch-building) or cut some things apart that came in one or more kits into pieces to make something else out of the starting materials (kit-bashing). The third option has always been to acquire brass models. I’ve been comfortable with building freight cars for a long time so my brass collection does not include any freight equipment. While I do attempt to include at least some currently commercially available plastic or resin freight car models, I don’t refer to any brass freight cars at all. This is because brass has been by nature very limited run and because brass manufacturers and importers have come and gone more frequently in the marketplace than some other manufacturers. Basically, I think that if you own any brass models of New Haven rolling stock you already know it and don’t need me to point it out. This page is structured to be about models that relate to the prototype and not a complete history of who has produced which models…although I do wander at times. I’ve tried to at least broadly identify all New Haven series of freight cars whether I have models of them or not. Just because a number series is rather large does not mean that I have made a decision to include or exclude all cars in that series. It may mean the cars are on my (long) list of cars to build or that some types of cars are less interesting to me or less useful to include on my layout. I’ve taken the opportunity in some cases to identify starting points for building some models to represent some of the prototype cars. In the 1960’s, the New Haven reassigned a number of 40’ boxcars that in earlier times (way before 1959), were occupied by other car types. I leave it to modelers interested in those times to provide information about those cars. The New Haven Railroad rostered a number of flat cars that served in a variety of roles. Many flat cars in General Service were converted for specialized service over the years, and there were also cars designed and built for specialized service. Depressed Center Flat Cars (DCFC) were used to move over-dimension loads on a railroad. The lowered deck of a DCFC was designed to provide adequate overhead clearance to such obstructions as wires, tunnels or bridges. In order to account for heavier loads, DCFC’s were designed in a range of capacities. On the New Haven, the largest DCFC’s were designed for a capacity of 200-tons. The New Haven described this type of car as a Transformer Car for good reason; the New Haven served General Electric and Westinghouse, both of whom manufactured high voltage transformers in different locations served by the New Haven, so the transport of transformers was the primary (but not only) use of this car type on the railroad. The New Haven was an early adopter of Trailer on Flat Car (TOFC) service in the late 1930’s. Until the New Haven began building flat cars specifically for Highway Trailer Service in 1951, General Service Class FM flats were converted to satisfy demand. As Highway Trailer Service grew, the New Haven kept pace by building their own design of Highway Trailer Service cars and ultimately building the unique Clejan Highway Trailer Service cars. As TOFC standards developed, the New Haven purchased off-the-shelf flat cars that were compatible for interchange service with loading facilities of other railroads. The New Haven also rostered a small fleet of Bulkhead Flat cars converted from General Service flats from about 1959-1968 for gypsum board and brick service. In 1962-3 the New Haven obtained 50 85’ Class FC General American G-85 flat cars equipped for Highway Trailer Service. The primary reason the New Haven acquired these cars was the increase in length of general service highway trailers to 40’ which was beyond the capacity of some New Haven cars. In addition, the TOFC industry had standardized on flat cars equipped with ASF trailer hitches, rendering the New Haven 18100-series cars incompatible with trailer loading facilities of many other railroads. A reasonable stand-in model for this car can be made starting from an Athearn 85’ general purpose flat and adding appropriate detail parts. Walthers has announced production of a ready to run model in February 2019. This is a better starting point to make a New Haven version. The New Haven Railroad rostered 32 Depressed Center Flat Cars (DCFC, called Transformer Cars on the New Haven) built over more than 33 years with the newest cars built in 1954. There were two large electrical equipment customers on line; Westinghouse located in the Boston area and General Electric located in Pittsfield, MA. Transformer cars could be seen anywhere on the system. The Class FW 17050-17059 series 90-ton cars were built for the New Haven by Osgood Bradley in 1929 and were used in service until the end of the New Haven. Some were in service as late as 1970. NH 17058 is the old Red Ball kit. I liked the wooden deck, but replaced the center deck section of plain sheet styrene with a detail part from Eastern Car Works. I fabricated the grabs and stirrup steps, and used the correct ECW trucks. they were very similar to the earlier 17950-series cars and also had a capacity of 90-tons. NH 17069 was built straight from the Eastern Car Works kit. The underframe is a very good representation of the Commonwealth casting, but the finished model is very light. Plumber's Epoxy, which I've used to weight the noses of aircraft with tricycle landing gear, can be worked in small amounts and used to increase the weight of this car while keeping the detailed underframe intact. Walthers released a model of a 90-ton capacity DCFC that appears similar, but it is based on a later, Soo Line railroad prototype. With Red Ball and ECW both gone there is no accurate model of any of the 17050-17069 DCFCs. The New Haven Class FD cars 17080-17082 were built by the railroad at the Readville, MA Car Shops in 1942. These longer cars were equipped with 6-wheel trucks that resulted in a capacity of 125-tons. The car was 58'4" over the end sills. The center deck was 22' between the perpendicular lugs used for securing loads. The end decks, above the curve section, were 12' 4 1/4" in length. The car was 8' wide over the side sill steps. The trucks were equipped with 30" diameter wheels. NH 17080 is built from two Bachmann Silver Series 52' DCFC's as a starting point. There were two steps to the process. The first is removing everything that is not New Haven. This includes the triangular gussets on the side sills. The second step is to add everything that is New Haven. Two cars were spliced to make an 11’ center deck. The end sills were removed and end material with end sills was added from the donor kit so each end deck was 12’ 4¼” long. The weights were removed from the original underframe and the underframes were spliced to the correct length. The weights were filed to fit their new location. I used the trucks that came with the car because they are a good match and the detail is acceptable. I replaced the wheels with 30" diameter wheelsets from NWSL. I spliced two slotted decks I ordered from Eastern Car Works. Like the underframe, I staggered the joints of the deck. What I ended up with was the spliced car body joined in the center, the spliced underframe joined to the left of center and the spliced deck pieces joined to the right of center - to add strength to the final model. I also used the brakestands and stirrup steps from Eastern Car Works 90-ton DCFC kit. I used Kadee Equipco hand brakes. Grabs on the carbody were formed from brass wire. I made the lugs at the end of the center deck from 0.010” sheet styrene. Scribed wood was used for the decking. This small series consisted of 62½-ton capacity DCFC’s built in prior to 1921. There is no known model available. This small series consisted of 70-ton capacity DCFC’s built in 1923 by the Standard Steel Car Company. There is no known model available. These DCFC’s had a capacity of 200-tons and were equipped with four 4-wheel Dalman trucks connected into sets of two by span bolsters. Employees at the railroads’ Readville Shops near Boston, MA built the cars in January and February of 1954. An old (out of production – OOP) Walthers kit (932-56xx series of kits) is suitable as a starting point to produce an HO scale model of these cars. A more recently released Walthers version is not suitable as it is based on a later TTX car design. The New Haven Railroad rostered 175 General Service flat cars built in two groups in 1937 and 1944 that were of different designs, During their service lives they served a variety of uses ranging from Highway Trailer Flat Cars to Bulkhead Flat Cars for brick and gypsum board service. Fewer than 90 cars survived from both series of flat cars in December 1968. The Class FM 17200-series flat cars, built in 1937 by shop forces at the Readville Shops using steel underframes from Bethlehem Steel Company order number DF-8746 completed May 29, 1937. These cars were in general service on the New Haven until the end of the railroad in 1968. These cars can be identified by their welded construction due to the lack of rivets along the sides. The NH converted a number of general service flat cars from the 17200-17274 series 70-ton flats to Class FC Highway Trailer service. The converted flats were in service from the late 1937 to 1947. As 17300-series flats were converted to Highway Trailer Service these cars were converted back to General Service flat cars. In 1951 when the 17500-17699 40’ flats built specifically for Highway Trailer Service arrived, all 17200-series flats were converted back to General Service Class FM flats. NH17264 was built before I decided on a specific era. I built it starting with an Athearn 40' body and heavily modified with scratch-built parts, including an operating apron and Scullins sideframe trucks. The 35' rib side trailer is kitbashed from two Walthers 32'-ers and lettered with Pen Bay decals. Speedwitch Media has produced an accurate resin kit for modeling the general service flat version of this car. It’s kit # K-102 in their catalog. The New Haven owned a larger fleet of 70-ton general service flat cars that were also Class FM. These were built in 1944 by the Greenville Car Company to the AAR 70-ton design, which was a riveted design and were equipped with ‘Unit’ type trucks and Universal drop staff hand brakes. A number of these were converted to Class FC Highway Trailer service beginning in late 1947. In 1954 when the 17800-17899 Highway Trailer Service flats were in service, the 17300-series flats were converted back to Class FM General Service flats. Beginning in December 1959 through September 1961, some of these cars were converted into small groups of Bulkhead Flat Cars. 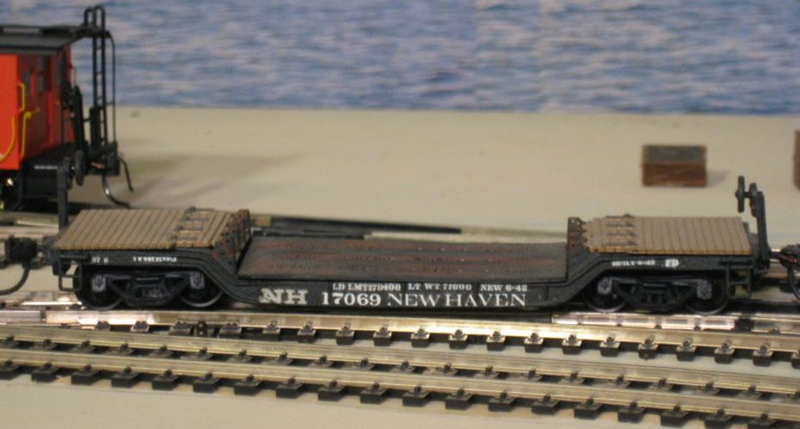 Intermountain produced a model of the 17300-series car lettered for the New Haven. The model is based on a B&O prototype. I have not examined a completed model to compare against the New Haven cars, but some reviewers think it is an accurate model or very acceptable stand-in. Sunshine Models produced an accurate resin kit for modeling this flat car that is discontinued, but I have one on my kit shelf to build. The New Haven built several series of 40’ 50-ton flat cars specifically for hauling highway trailers up to 35’ in length from 1951 to 1953. All cars were equipped with ASF A-3 Ride Control 50-ton trucks and Universal Drop staff hand brakes. The 17500-17699 series was built with castings supplied by General Steel Castings Corporation in Maybrook, NY in 1951. In 1955 40 cars were converted to Rail-Laying Service for part or all of that year. In 1956 cars were no longer listed in this service. In 1959 there were still 167 17500-17699 series cars listed in Highway Trailer Service. The 17700-17799 series was built with castings supplied by General Steel Castings Corporation in Readville, MA in 1953. Chad Boas, 30 N 30th street, Lafayette, IN. 47904, produces resin casting to make models of the 17500-17699 and 17700-17799 series cars. If you don’t model TOFC service, in later years some of these flats ended up in Work Train service. In 1954 the 17800-17899 series was built at the Readville Shops using castings from International Steel Company. All cars rode on ASF A-3 Ride Control 50-ton roller bearing trucks, split evenly between Timken and SKF and were equipped with Universal Drop staff hand brakes. In 1959 all 100 17800-17899 cars were still listed in Highway Trailer Service. The trustees sold off hundreds of 17500-17899 cars in 1963-64 to second hand equipment buyers to raise cash and pay off the trusts under which they were acquired. Some of the excess funds from this sale went into the program to rebuild the DERS-2c units and also for the acquisition of the DERS-7 & 8 units. A convincing model of the 17800-series cars can be built from the old Ulrich metal flatcar kit which is long out of production. These cars still show up on internet auction sites and at train shows. The decks and sides need some work to more closely resemble a New Haven car. Models of 17500-17899 flats can be equipped with Intermountain, Kadee, Kato, Tahoe Model Work or Tangent ASF A-3 Ride Control trucks. Since the difference between a 50-ton and 70-ton truck is based on the journal dimensions you can reasonably use whatever manufacturer you prefer. There are differences in accuracy among all manufacturers, and overall the Intermountain trucks are the least prototypical in appearance. In 1955 the New Haven built two prototype TOFC cars numbered 18000-18001 that incorporated the unique trailer securing system developed in France by Deodat Clejan. The two cars were of 75’1” length and capable of carrying two 35’ trailers. A detailed article on these cars and how to effectively model them was written by Marc Frattasio and published in the Shoreliner (quarterly magazine of the New Haven Railroad Historical and Technical Association – NHRHTA) in 1986, Volume 17, Issue 2. Even though these cars should be on my roster, I will continue the use of the 17500 to 17899-series cars that show up mixed in with Clejan cars in TOFC consist photos and were still reported on the December 1959 Summary of Equipment. Beginning in 1959 the New Haven converted several 17300-series cars to Class FS bulkhead flats. By December 1959 the 19000-19006 series were built with steel bulkheads applied by Pullman at Worcester, MA. These cars were designed for gypsum board service. In 1961 additional cars were converted to the 19100-19111 series with outside braced wood bulkheads with spaces visible between the bulkhead boards for use in brick service. These cars were built in two groups and the 19100 -19105 series were 6 feet 5 inches extreme height (from top of rail - 2'6" from the deck) while the 19106-19111 series were 7 feet 5 inches extreme height. (4'0" from the deck). NH 19106 was built by friend and fellow modeler John Kasey based on the Intermountain flat car. I really wish the New Haven needed to built these cars in 1958! Intermountain produced a model decorated for the 19000-19006 series, however the bulkheads are not correct according to drawings and photos. Unmodified, the car is only a reasonable stand-in. Beginning in 1941 The New Haven acquired a fleet of steel boxcars to replace its fleet of smaller, lower capacity, wood boxcars. Up to this time, many of the railroads wood boxcars had been rebuilt with steel frames to keep them in revenue service, but heavy demand for the movement of materials in WWII would render cars of that construction unsuitable for severe utilization to support the war effort. All cars from 30000-35999 were originally delivered painted freight car brown equipped with black sliding doors. The cars were lettered with a large “script” herald to the left of the door with the road number and dimensional data all stenciled to the right of the door opening. This same arrangement was retained when the cars were repainted except the door was painted freight car brown like the sides at this point. The ‘Delivery’ paint scheme for New Haven boxcars has been a somewhat controversial subject. In my research efforts, all photos of boxcars at the time of or shortly after delivery indicate the doors were originally painted black and were painted brown when the cars were repainted. In most photos, even if the repaint stencil is not legible, it can be detected as present on the car because the service stencils were usually located in a standard position on the side of the carbody. These are 1937 AAR design 10’ IH (inside height) boxcar built by Pressed Steel Car Co. in 1941. The cars were equipped with Dreadnaught ends and 6' Youngstown doors and wood running boards. This was the only series of New Haven boxcars originally equipped with wood running boards. Some of these cars were renumbered to the 36000-36999 series by the McGinnis administration in 1955 and repainted in the New Image scheme at that time. At the time the cars were renumbered and painted, if not earlier, the wood running boards were replaced by Apex Tri-Lok running boards. Another modification to this series of boxcars at the time of refurbishment was the installation of steel floor plates between the bolsters. A stencil identifying this modification was applied on the outside of the car on the side to the lower left of the door opening. This stencil, applied to other refurbished car series as well, read; “FLOOR PROTECTION PLATE BETWEEN BOLSTERS”. This is a two-line stencil of 1” high letters with a ¾” spacing between lines that is relatively easy to spot in photos because of it’s location even if it is not legible. Speedwitch Media produces decal set D118.1 that includes this lettering. Still later, cars from the original series were renumbered into the 20000-20038 series in the 1960's. The table at the end of this section on boxcars details the various appliances fitted to each series of New Haven boxcars. Most of the parts described are commercially available in HO scale. NH 30023 is a Red Caboose kit built straight from the box. This car is in a repainted version of the delivery scheme..
Pullman Standard delivered these cars was in 1944 as Lot 5780. This car was part of the larger series 31000-32499. Other cars within this larger series were equipped with a variety of hand brakes, trucks and doors as detailed in the table at the end of this section. All New Haven boxcars from 30000-305999 were delivered in freight car brown carbody, black doors and large Script herald on the right-hand side of the door. In later repaints, the scheme was simplified and the doors were painted the same color as the car body. 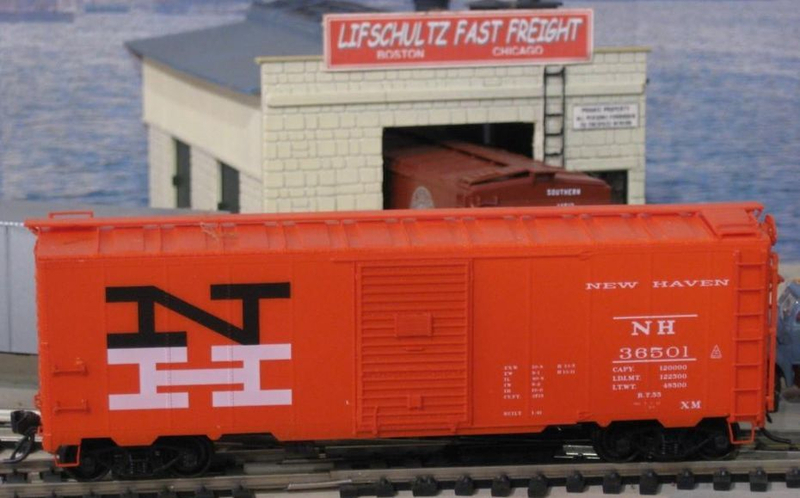 NH 31185 is a Branchline kit out of the box, and it's an accurate model of the 1937 AAR 10'0" IH 40' boxcar. All New Haven boxcars from 30000-305999 were delivered in the scheme depicted here; freight car brown carbody, black doors and large Script herald on the right-hand side of the door. Pullman Standard delivered these cars was in 1944 as part of Lot 5780 for the 31000-31349 series. These cars were originally built with Apex Tri-Lok running boards, Miner hand brakes and 6’ Superior 7-panel doors. The cars were equipped with Unit type trucks. This car was part of the larger series 31000-32499. Other cars within this larger series were equipped with a variety of hand brakes, trucks and doors as detailed in the table at the end of this section. Some cars from the 31000-31349 series were renumbered into the 21000-21285 series later during the New Havens’ existence. During that time, the New Haven was applying a scheme known generally as the “Alpert” or “Trustee” paint scheme. Branchlinealso produces a kit with the later-style renumbering and paint scheme. Branchline, Red Caboose and Intermountain 1937 AAR 10’IH Steel Boxcar models come with wood running boards that need to be changed to the Apex Tri-Lok type provided as a detail part by both Kadee and Plano. NH 31501 is a Red Caboose kit of the 10’IH 1937 AAR 40’ Steel Boxcar that came from the manufacturer painted in the McGinnis or New Image scheme. This car represents the 31500-31649 series of 10’IH 1937 AAR design 40’ Steel Boxcars delivered to the New Haven in October 1944 by Pullman Standard as part of the larger group of 31000-32499-series cars. As with all New Haven boxcars after the 30000-30999 series, these cars were equipped with Apex Tri-Lok running boards. This group of cars was equipped with Miner hand brakes, AAR style trucks and 6’ Superior 7-panel doors. Cars from the original 31500-31649 series were later variously renumbered into the 21000-21285, 23000-23094, and 23100-23494 series. Some cars from the 31650-31699, still in the McGinnis or New Image scheme, were renumbered into the 37000- and 38000-series. Some cars from the 31000-31349 series were also renumbered into the 21000-21285 and 21500-21634 series. Some cars from 31650-32999 were renumbered into the 21700-22823 series. Boxcars based on the 10’IH 1937 AAR 40’ Steel Boxcar design were also built for the New Haven in 1944 by Pullman Standard, but evidence exists that cars in the 32500-32999 series were not built at the P-S Butler, PA facility. These cars were also equipped with AAR (modelers “Bettendorf”) type trucks but had 6’ Youngstown doors and a variety of hand brakes. Cars from the original 32500-32999 series were later repainted and renumbered into the 21700-22823 series. From June to December 1945, the New Haven railroad accepted cars in the 33000-33499 series as Lot 5809 from Pullman Standard. Appliances on this group of cars was fairly consistent as all were equipped with 6’ Youngstown doors, Apex Tri-Lok running boards and Universal hand brakes. In the post-war period, freight car design was changing. These cars had roofs and car sides that were very similar to the 1937 AAR design, however the old Dreadnaught ends were replaced with 3/4 Improved Dreadnaught ends with the sections joined by rivets. Cars 33100-33499 were equipped with door protection posts, which narrowed the 6’ door opening to 5’9”. These cars were identified with a three-line stencil consisting of 1” high letters and the lines spaced ¾” apart which read; “CAR HAS DOOR POSTS FOR PROTECTING DOORS AND LOADING”. These cars were the only New Haven boxcars stenciled in this manner. Cars 33400-34999 were equipped with ASF Ride Control trucks instead of AAR trucks. The remainder of all New Haven 40’ steel boxcars from Pullman Standard (ending with car 35999) was equipped with this type of truck. These cars were delivered in the standard scheme of freight car brown with black doors. Early repaints conformed with both carbody and door painted freight car brown. Photographic evidence suggests this group of cars was not repainted from this scheme until the post-McGinnis era into the “Alpert/Trustee” scheme. NH 33291 was built using an Intermountain 1937 AAR carbody and roof in combination with Intermountain 10’IH 3/4 Improved Dreadnaught ends. The Intermountain ends represent a later design with welded seams that I backdated to the correct design by application of Archer rivet decals and by replacing the bottoms of these ends with the end bottoms from the original 1937 AAR boxcar kit to retain both rivet detail and poling pockets. Kadee Apex Tri-Lok running board and Universal hand brake were added, and I used Branchline brake platform brackets because they are the correct size to fit the corrugations of the Improved Dreadnaught ends. I also built a version of this car using Branchline 10’6” IH Improved Dreadnaught ends that have the correct rivet detail but are 6” too tall. The height of these ends is corrected by removal of the top stiffener rib. The safety appliances from the Intermountain 1937 AAR boxcar kit are used since those that come with the Branchline ends are too long once the ends are shortened to the correct height. I presented a clinic on this car series at the 2008 NHRHTA Reunion. Intermountain has released an HO scale model of this box car available in a later New Haven scheme. NHRHTA released the car in this lettering style. Between December 1947 and January 1948 Pullman Standard produced Lot 5882 for the New Haven which became road numbers 33500-33999. This group of cars represented a “big” change in boxcar design for the New Haven as it was their first group of early PS-1 10’6” IH steel boxcars. Unlike the earlier 1937 AAR 10’IH boxcars, these cars were built with P-S proprietary roof and end designs. The cars were all equipped with ASF Ride Control trucks, 7’ 7-panel Superior doors and Apex Tri-Lok running boards. NH 33870 was built by Ted Culotta who wrote an excellent article in the January 2008 issue of Railroad Model Craftsman describing how to build a model of these cars. Kadee has announced they are releasing an HO scale model of this Car early in 2019. Between November and December 1945 Pullman Standard built Lot 5894 of 10’6” IH early PS-1 design boxcars for the New Haven. The New Haven assigned these cars road numbers 34000-34499. All cars in this series were outfitted with Apex Tri-Lok running boards, 7’ 7-panel Superior Doors and ASF Ride Control trucks. Hand brake variations are described in the table at the end of this section. In 1955, cars 34001-34020 were equipped with Evans ‘DF’ Loader appliances and repainted to highlight the installation of this equipment. This group of cars was reclassified Class XML at that time. NH 34013 is from a Walthers PS-1 kit offered by NHRHTA in the past. It’s a decent stand-in model, provided the lower door guides are positioned lower on the side sill and the doors are replaced (which mine are not, yet) with a 7'W 7panel 10’6”H Superior 7-panel Door (Southwest Scale Productions part FC770), made by Southwest Scale Productions; Dan Hall,2504 Rannoch Lane, Fort Smith, AR 72908. Branford Hobbies offered a custom-painted model based on an Intermountain kit that also requires replacement of the door. Accurail also produced a model of this car that can be corrected by narrowing the door opening, changing the door as described above and modifying the tabs of the side sill to better match the prototype. In April 1948 Pullman Standard supplied the New Haven with two more groups of 40’ Steel Boxcars that represented the last of this type the New Haven would own. 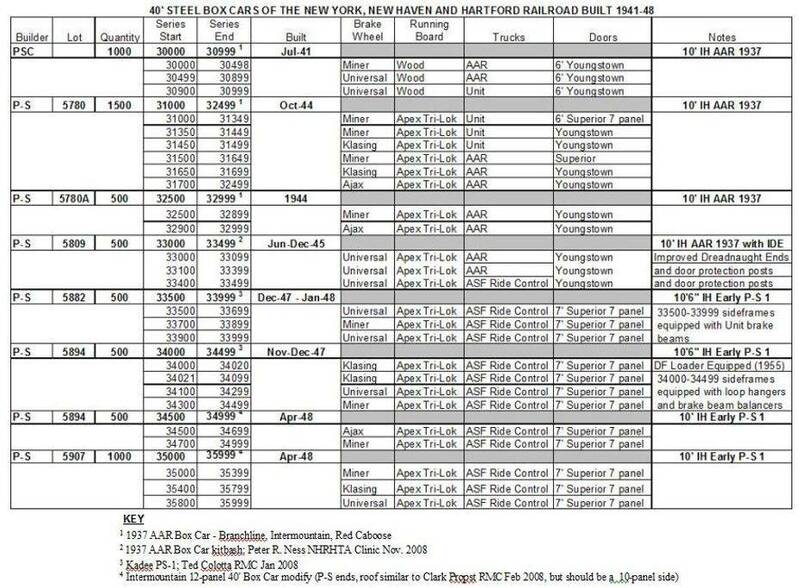 The cars were built in Lot 5894 (34500-34999) and Lot 5907 (35000-35999) for a total of 1500 cars. All cars in this group were still the early PS-1 type, but reverted back to a 10’IH design. It has been noted by the late author David Sweetland that records show the earlier 10’6” IH cars and the first 500 of these 10’IH cars share the identical Pullman Standard Lot number; I can add nothing to clarify the confusion at this time. In the February 2008 issue of Railroad Model Craftsman, Clark Propst describes how to build a very similar car to this New Haven type. The main difference is that Clark uses an Intermountain 12-panel side carbody as a starting point while the New Haven cars were 10-panel sides. I’ll be exploring how to model one of these in 2009. 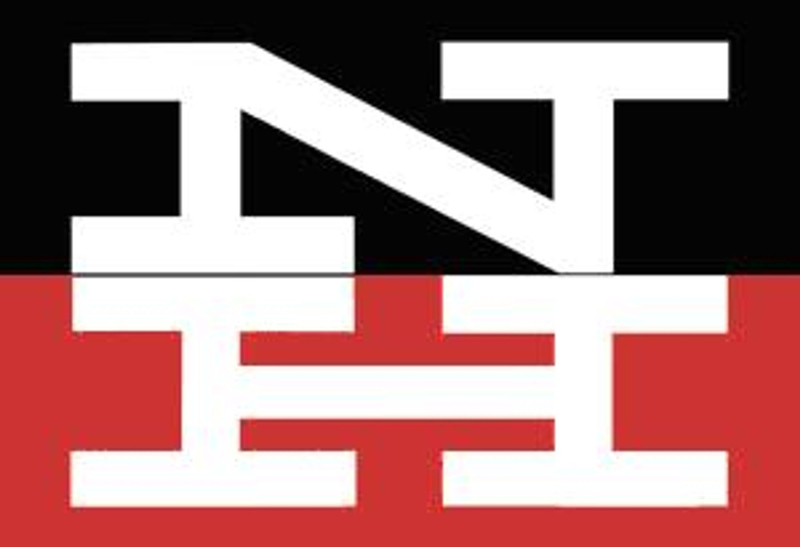 In the era of New Haven President Patrick McGinnis, the popular Herbert Matter-designed “New Image” paint scheme featuring the distinctive “block letter” NH herald began to be applied to New Haven property and equipment. Cars that were repainted into the “McGinnis” or “New Image” scheme are easily identified by the bold use of red-orange or black for the carbody, and sometimes the car doors or safety appliances painted the contrasting color. Part of the intent of the “New Image” concept was that portions of each scheme could be intermixed, resulting in variation that was somehow ‘standardized’. By 1956 when boxcars from the 30000-35999 series were being sold, refurbished and leased back to the New Haven, the “New Image” scheme was being applied and three additional number series were used for this purpose. The new series were the 36000-, 37000- and 38000-series, which were filled out with groups of cars. None of these number series was completely filled (i.e., 36000-36999) and when cars were renumbered from the original 30000-35999 series, the renumbering was not sequential – meaning a car with the last three digits being a high number could have been renumbered with the new last three digits becoming a low number, and there was also no specific correlation - meaning the 30000-series cars renumbered as 36000-series, the 31000-series renumbered as 37000-series and so on. Instead, blocks cars from one of the original number series were renumbered somewhere into one of the new number series. In still later years cars were again refurbished, sold and leased back to the New Haven in a series of complicated financial maneuvers. In these instances the cars were renumbered into different number series. Where I have information available I have tried to include it, but these shenanigans could be a study in themselves. During the administration of New Haven President Alpert and after that when the railroad entered its’ last bankruptcy and administration was overseen by a Board of Trustees until inclusion of the New Haven into the Penn Central Railroad, a modified “New Image” paint scheme was applied to refurbished boxcars. In this scheme, an all-white block-letter “NH” herald is applied to the right of the door and the road number was moved to the left side. Most of the dimensional data remained on the right side of the car but was relocated towards the end of the side away from the door so that it was readable by agents, yard crews and shippers when the car door was open. For the Alpert/Trustee scheme, as a cost-cutting measure, the New Haven reverted to an overall freight car brown scheme. All New Haven Steel Boxcars were Class XM unless noted otherwise in the description. The 36000-36999 series cars were renumbered from the original 30000-30999 series boxcars that were built in 1941 by Pressed Steel Car Co. for the New Haven. When the prototype cars were sold, rebuilt by the Hyman Michaels Corp. and renumbered in 1955, the sides were stenciled with a small triangle that contained information about the surface preparation of the car (sand-blasted or wire brushed) and paints used for the McGinnis 'New Image' scheme. NH 36501 is a Red Caboose kit of the 1937 AAR box car and features free-standing grabs and ladders and has the correct 10'0" IH. NH 36803 is an Intermountain kit representing another of the rebuilds from the 30000-30999 series. The model accurately represents the 1937 AAR design boxcar as sold, repainted, renumbered and leased back to the New Haven beginning in 1955. In addition to the fleet of 40’ Steel Boxcars, the New Haven added two more groups of boxcars before the demise of the railroad in 1968. In 1956 the New Haven accepted delivery of cars 40500-40514 built by Pullman Standard. The New Haven had placed an order for a larger quantity of cars, but due to its financial situation at the time, could not afford more than fifteen cars from that order. The remainder of the cars was delivered to the Chesapeake & Ohio Railroad. These 50’ PS-1 boxcars were equipped with two Improved Youngstown sliding doors on each side; one 7’ door and one 8’ door for a total door opening width of 15’. NH 40501 was produced by Robins Rails for NHRHTA back when dinosaurs roamed the earth. Newer, more detailed versions are made available from Kadee, Atlas and Intermountain. The Kadee model is most detailed and accurate. NH series 40600-40605 Steel Box Cars Not in service in 1959. The last group of boxcars purchased by the New Haven was the 40600-40605 series of 50’ PS-1 boxcars equipped with cushioned underframes for load protection. Pullman Standard built these boxcars equipped with an 8’ plug door in 1965. NH 40605 is from an E&C Shops (OOP) kit right out of the box. For it’s time it was a detailed kit featuring separate end ladders and brake detail similar to todays’ Branchline Blueprint, Intermountain and Red Caboose kits. Currently Accurail produces a stand-in model; the door is also incorrect. In 1953 Pacific Car and Foundry built 100 Insulated Heated Boxcars, Class XIH that became road numbers 45000-45099. These cars were equipped with underbody-mounted charcoal heaters, 6’ Camel plug doors, Universal hand brakes and ASF Ride Control trucks. At the same time these cars were being built, PC&F was building a larger order of the same type of car for the Bangor and Aroostook Railroad. The BAR had developed a flashy red white and blue paint scheme for their cars with “STATE OF MAINE” emblazoned across the upper horizontal area of the car side. Rather than spend additional money, the New Haven opted to have the same scheme applied to their car order for a lower cost. In addition to reporting marks, the only other difference was application of the New Haven “script” herald in the same location the BAR cars had that railroads herald applied. This was more than just frugality on the part of the New Haven, as their cars served in pool cars in Maine during the potato harvest season, so the paint scheme was somewhat appropriate. At a later point, the underbody car heaters were removed and the cars were reclassified as Class IH. The cars were often used to haul clean lading such as rolls of newsprint. Between 1966-8 many of these cars were repainted into a freight car brown Alpert/Trustee scheme at the Cedar Hill or Maybrook facilities. NH 45014 was custom-painted by the defunct company, New England Models and is based on an equally old Train Miniature kit. A more accurate model of this car was produced as a resin kit Funaro & Camerlengo for NHRHTA but is also out of production. Currently a company named Moloco produces the Evans vents found on the sides of the prototype, I will gussy up my models with Kadee running boards and hand brakes, Kato trucks and the Moloco Evans vents…maybe a correct plug door can be located as well. The New Haven rostered a number of General Service gondolas. Early types were used for hauling coal and coke before proper hopper cars were designed and built. Many were originally built with drop doors at the bottom of the car body. Gondolas are a low-sided open car which facilitates loading by hand. When equipped with drop doors, discharge of the load from the cars can be a semi-automated process. As will be seen, there are specialized typed of gondolas in addition to general service types. New Haven gondolas numbered 51000-57499 were all built in between 1906-1911 and were out of service by 1959. In 1930 Standard Steel Car Company built a group that was equipped with drop doors as well. These were cars 50000-50014 and were described as 50-ton coke cars, general service. Photographic evidence shows these cars survived in service at least until the mid-‘50’s. In a situation not as complex as the boxcars, some of these cars were rebuilt and renumbered as explained in the descriptions as appropriate. A general note on newer gondola models; Model Power produces a 40’ steel gondola painted for the New Haven, which has incorrect sides. Bowser also produces a model with an incorrect number of panels, and the examples I have seen have poor quality paint jobs. Accurail is producing one lettered for New Haven, which also has an incorrect number of panels and is based on an Atlantic Coast Line (ACL) prototype. In 1929 employees at the New Haven, CT shops built a series of 40-ton hoppers with drop doors numbered 58000-58499. These cars were originally equipped with drop doors. Later the doors were welded shut to create a solid bottom car. These cars were equipped with Miner or Universal hand brakes. NH 58145 is an MDC Roundhouse model. Before Roundhouse joined the Horizon Hobby label and redirected its product line to older HO scale models, they retooled many of the dies for their products including their gondola. This kit was produced with the retooled dies and although not up to today’s standards, the rivets and other detail is crisply molded. Fitting this car with detail parts such as separate grab irons and stirrup steps will improve its appearance. Funaro & Camerlengo has released an HO scale resin kit correctly detailed for these cars. These cars were renumbered from the 58000-series when rebuilt by the International Car Company in 1955 as solid bottom cars by welding the drop doors closed. At that time they were also reclassified as Class GA2. When rebuilt, the cars were repainted with a variation of the New Image paint scheme featuring a red-orange block-letter “NH” applied to the car side. The road number and dimensional data remained white. In 1937 and 1939 employees of the New Haven, CT shops also built two series of 50-ton gondolas. One that was not equipped with drop doors (60000-60499, built 1939) and one that was (60500-60649, built 1937). The former were equipped with AAR type trucks and various hand brakes while the latter were equipped with Dalman trucks and Ajax hand brakes. The groups were classed GA3 and GA respectively. The 61000-61249 series was created when the International Car Company rebuilt gondolas from the 60000-60649 series cars in 1955. Where appropriate, drop bottom doors were welded shut to create solid bottom cars and all were classified as Class GA3. Neither truck nor hand brake types were changed. NH 61075 is another MDC Roundhouse kit from the retooled dies that represents one of the 1955 rebuilds. It is factory painted in the New Image scheme appropriate for these cars. Brand new in 1959, the year I am modeling, the Bethlehem Steel Company built 15 covered gondolas, Class GRBS at Johnstown, PA for the New Haven which were numbered 62000-62014. The cars were equipped with National C-1 trucks, Miner hand brakes and Apex running boards. On many other railroads, covered gondolas at this time were used for the transport of steel coils. The design of the car, with removable top panels provided of easy loading and the covers offered the metal coils protection from the elements. On the New Haven Railroad, these cars were used to service the needs of the brass industry centered for the most part in Connecticut. The cars lasted in service well beyond the end of the New Haven railroad. NH 62007 is built from an Athearn kit that was custom-painted by Rail Runner (out of business). Athearn produced this car decorated for the New Haven at a later date. NOTE: The New Haven owned a tremendous number of wood boxcars that were (for the most part) condemned and destroyed long before 1959. The number series ranged from about 60000-78299 and 84000-87850 when rebuilt about 1935 to 150000-172399 when originally built in the early 1900’s. As seen, over time newer rolling stock re-occupied some of these number series. While most of the old boxcars were condemned and destroyed, some soldiered on for additional decades in work service. Such cars will be described on my ‘Maintenance of Way’ page as available. This information is provided only to account for some gaps that appear in New Haven freight car numbering schemes. The New Haven owned a variety of steel hopper cars, some of specialized design. Most people are familiar with open hoppers as ‘coal cars’, but they are a versatile car capable of handling a variety of loads. The New Haven also used open hoppers to transport trap rock from quarries in Connecticut, sand from Cape Cod, MA to locomotive facilities and in covered hoppers, cement was transported. In May 1953 Pullman Standard built 550 70-ton triple bay steel hoppers for the New Haven in the series 80000-80549. 450 of the Class HT cars were equipped with Universal hand brakes while the remainder was outfitted with Champion Peacock hand brakes. All cars were outfitted with Wine door appliances. Cars 80000-80249 and 80350-80549 rode on ASF Ride Control trucks while cars 80250-80349 were equipped with National C-1 trucks. NH 80229 is an MDC Roundhouse kit painted and lettered for the New Haven. These were made with retooled dies. Before the dies were retooled, Branchline did a custom-painted run in the days before developing their own fine kits and Robins Rails produced a custom-painted run of Roundhouse cars for NHRHTA. Much more recently Atlas has produced a model painted and lettered for the New Haven. While the dimensions are more accurate for the Roundhouse car, the detail is finer for the Atlas car. Name your poison. NH 81000-81028 Steel Hopper Cars Not in service in 1959. In 1965 the New Haven leased 29 70-ton offset side 3-bay steel hoppers from US Railway Equipment numbered 81000-81028. Cars in this series were originally built in 1929 and 1930. They were later purchased by the New Haven. NH 81011 is from an Athearn kit that is accurate for these groups of cars. The kit was produced years ago by NHRHTA. NH series 100001-100876 Steel Hopper Cars (no photo) Not in service in 1959. These 50-ton open steel hoppers were built in 1910 and included Classes HM, HMB and HMB-1. NH series 115000-115386 Steel Hopper Cars Not in service in 1959. The New Haven built 55-ton hoppers 115000-115386 in 1929 at their New Haven, CT shops that were Class HM-2. The cars were equipped with Dalman trucks and Ajax hand brakes. While these cars were not in revenue service in 1959 there is photographic evidence that some cars work converted to work train service and still on New Haven property into the mid-‘50’s at least. NH 115000 is a custom painted and lettered HO scale Athearn car from a company called Third Rail Graphics in the distant past. I will use photographs to convert these to correct ‘X’-series work train cars in the future. The conversion involves removal of the ‘115’ part of the road number and replacing it with the letter ‘X’ before the last three digits of the road number. Shouldn’t be too hard to get done. NH series 115500-115545 Steel Hopper Cars (no photo) Not in service in 1959. The New Haven built 55-ton hoppers 115500-115545 in 1910 at their New Haven, CT shops that were Class HM-2. The cars were equipped with Dalman trucks and Ajax hand brakes. While these cars were not in revenue service in 1959 there is photographic evidence that some cars work converted to work train service and still on New Haven property into the mid-‘50’s at least. NH series 116000-116249 Steel Hopper Cars Not in service in 1959. In 1940 Pullman Standard produced 250 Class HM 60-ton 2-bay open hoppers for the New Haven. The cars were equipped with Miner (116000-116124) and Ajax (116125-116249) hand brakes, AAR trucks and Wine door appliances. Evidence shows these cars to be in revenue service into the mid-’1950’s and still on New Haven property in yards into the late 1950’s. NH 116234 is from a 3-pack of Pullman Standard PS-3 34’ 2-bay hopper kits decorated for this car series way back in time by an HO scale manufacturer named Train Miniature of Illinois, informally known as Train Miniature. While the cars are fairly accurate, the placement of the lettering is not. Later Walthers took over the Train Miniature product line and released another car with a different road number in this series that was sponsored by NHRHTA. The lettering was improved slightly but still not correct. Until recently, this was something to live with because white lettering for New Haven freight cars hasn’t been readily available since Walthers ceased decal production and Champ decals aren’t quite correct for this application. The situation is changed with the release of Set D121 from Speedwitch Media which can be used to correctly letter these cars. They’re on my “must do” list. In April 1949 Pullman Standard supplied the New Haven with 15 Class LO 70-ton covered hoppers. These cars has a capacity of 1598 cubic feet and were equipped with Universal hand brakes, Enterprise discharge doors and Unit trucks. NH 117009 is an E&B Valley (out of business) kit. E&B Valley produced one of the first highly detailed models of its kind many years ago. The kit was much more challenging to assemble than the standard “shake the box” kit available at that time. The kit included a detailed running board and precise hatch detail. Nowadays, Kato, Bowser and Intermountain produce detailed models of this car to a higher level of detail (Kato does not make a car lettered for the New Haven and the Bowser New Haven model is incorrectly lettered). Replacing the running board on the E&B Valley kit will make a remarkable improvement in appearance. The New Haven returned to Pullman Standard in 1954 to purchase an additional 85 covered hoppers numbered 117015-117099. These cars were of similar construction except the sides were solid and the roof hatches changed from square to round. This group of cars was equipped with Miner hand brakes and ASF Ride Control trucks. Some of the New Haven cars were assigned to pool cement service with the Lehigh and New England Railroad and bore stencils to identify they were in dedicated service with the LNE. NH 117064 is an Atlas car. Many manufacturers have produced HO scale models of this particular car type over time. Another recent manufacturer is Kadee. MDC Roundhouse also produced a kit to build this car. NH series 120000-121499 Steel Hopper Cars Not in service in 1959. In December 1918 the New Haven received a total of 1500 55-ton 2-bay Class HM-1 hoppers numbered from 120000-121499 from several builders. The Pullman Car Company (before the formation of Pullman-Standard) supplied cars 120000-12299 and 121300-121499. The Pressed Steel Car Company built cars 120300-120699. Numbers 120700-121099 came from the Standard Car Company (later to become the other part of Pullman-Standard). Lastly the Ralston Steel Car Company provided cars 121100-121299. At this time I do not have information about the appliances and equipment on these cars. NH 120847 is built from an Accurail kit. Accurail, Athearn and Tichy have produced models of this car. Tichy has produced a kit to build NH 121300, which was a one-off built by shop forces at the Readville Shops in February 1933 with the addition of Union Metal Products sides. This particular car was rebuilt with panel sides in order to increase the cars’ capacity from the standard 1880 cubic feet to 1940 cubic feet. No additional cars were modified in this manner.